As a son of a woman, a spouse to a woman, the father of two young women and the uncle of several women, I could hardly let the decision in Hobby Lobby v. Sebelius go by without comment. 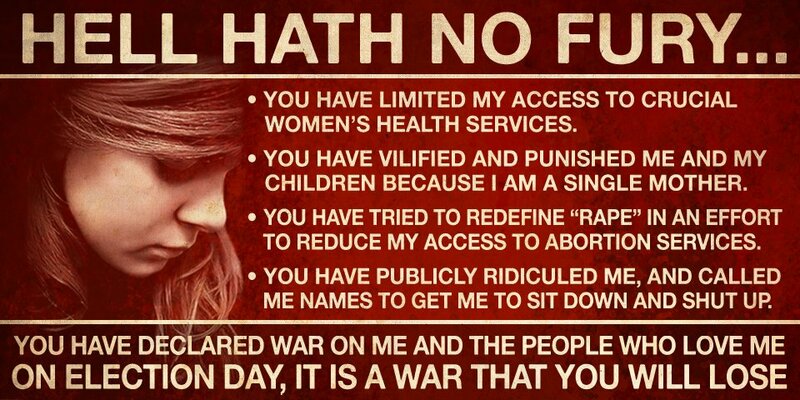 Briefly this is indeed a major setback for women’s rights in this country. It is also a major setback for those who believe that courts are impartial. 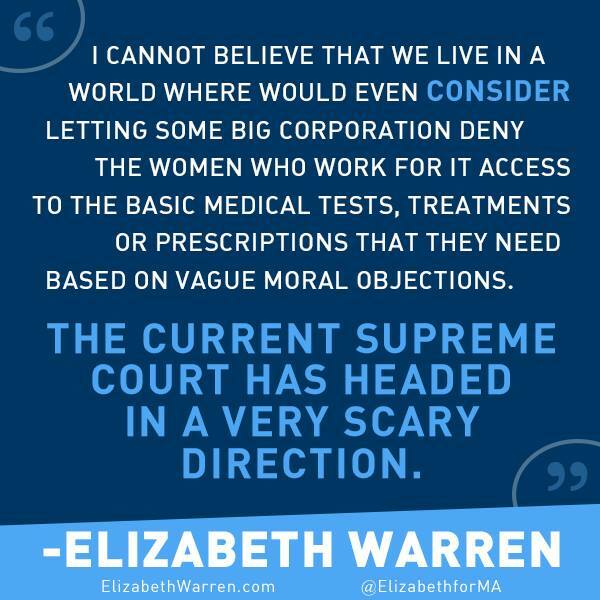 The Roberts Court has been shaped by reactionary leaders over a long period to favor the rich and powerful, the corporations over people at all turns. By picking very young justices, the Roberts Court will have more influence over lives in this country than almost any other group of politicians. All without any recourse from citizens. First, as with Roe v. Wade, the right in this country will play a long game in chip, chip, chipping away at the ACA until it is a gutted shell. Hopefully progressives in this country already realize this and also understand that a true single payer system like those in most other democracies is the only way to handle healthcare in this country. Supporting single payer healthcare should be the price of admission for all democratic candidates. Second, despite Justice Alito’s utterances to the contrary, religion will now be a major hammer for the right to attack all that they do not like in this land. More attacks on the ACA on religious grounds, even expect attacks on things like Medicare and Social Security. Can’t be done you say? Just wait. Third, this really strengthens the control the right wing has on women. Controlling people is one of the goals of corporations. By controlling people they can control things like wages and benefits. Fourth, where exactly does “religious” freedom end. As with many on the left I find most wars to be avoidable. Can I ask to be exempt from paying taxes that go to war and constant war preparation? This is but a small example of where this could go. No doubt there is still a contingent in this country that is religiously opposed to inter-racial marriage. Religious leaders have already asked that businesses be exempted from an expected executive order banning discrimination against gays on religious grounds. We have lift off. Fifth, hard not to notice that the five votes for Hobby Lobby came from five older white men all Catholic. In this case as most know contraception is mortal sin in the Catholic Church. Did they purposely impose their religious views as law? In any case as a group they are hardly representative of America as a whole. 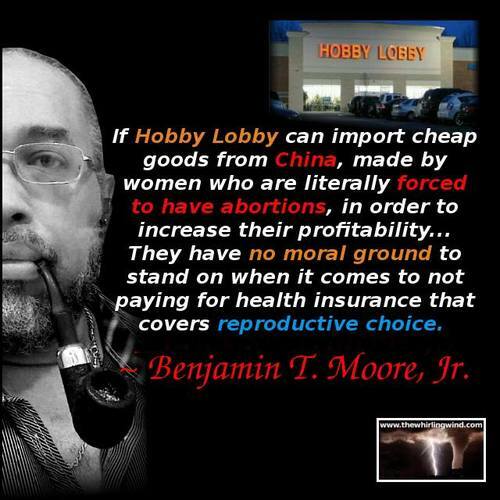 Sixth, Hobby Lobby is probably the very epitome of hypocrisy in this case. Apparently their religion say they can’t have anything to do with contraception as part of their pay package, yet by buying most if their merchandise from a country that has abortion and contraception as state policy, they contribute directly to sponsoring abortion and contraception in China. What does their bible say about hypocrites? This entry was posted in GLBT, SCOTUS, womens rights and tagged catholic church, contraception, Hobby Lobby, Justice Ginsburg. Bookmark the permalink.